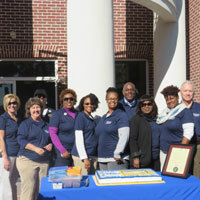 The Columbia campus location's celebration of the Webster University centennial on Saturday, Nov. 14, featured a proclamation from the mayor declaring Nov. 14, 2015, Webster University Day in Columbia. Faculty, staff, alumni, and students were in attendance to help celebrate Webster's 100 years. Webster has offered programs in South Carolina for over 40 years. Just off of Farrow Road at I-77 near Providence Hospital Northeast, many students find that the Webster University Columbia location's convenience, small class sizes and individual attention result in better networking opportunities and successful learning outcomes within their profession or local community.